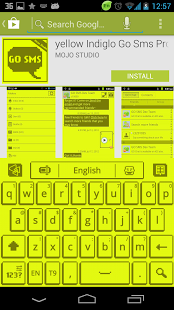 If you like this GO Keyboard, support our work and buy yellow Indiglo Go Sms, *You Would be paying for 1 Theme, and Getting the Other 3 for free*, SO it would be like paying 25 cents for each (GO CONTACT, GO SMS, GO Keyboard, GO Theme), if you just buy YELLOW INDIGLO GO SMS PRO. the 1 one has a box check that box in. 9)You Should be now in The Go Keyboard Settings, Click Theme Settings/ Select Theme (Choose The theme you want to use, if you didn’t dl one there should be one default one there). 10)Your Are Done (Short Cut) to change themes, While You are in your new Go Keyboard there is this key that should be to your lower left hand side called “123” with a settings symbol”, click(Hold down button) it will take you automatically to the go keyboard settings so you can change to a theme you want.